Laughter yoga is a new phenomenon sweeping the globe. It was developed in 1995 by Madan Kataria, a medical doctor from India, and is now practiced in more than 60 countries. The basic premise of laughter is that anyone can laugh without jokes or even a sense of humor. All one needs is the desire to laugh and let the joyful energy flow. Laughter yoga combines deep yoga breathing, stretching, and relaxation with laughter exercises for maximum health benefits. This program, the first of its kind, contains high-impact laughter yoga workout designed specifically for children, complete with a warm up, deep breathing, original songs, guided relaxation, and 27 unique laughter exercises. 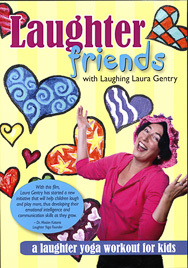 Each part of the workout is demonstrated by Laughing Laura and her 19 laughter friends, children ages 4 to 11. Laura Gentry is a certified laughter yoga teacher who has been a pioneer in spreading the laugher movement throughout the Midwest. She is also an author, artist, and ordained minister who started the first laughter club within a church. This color DVD is 36 minutes in length.